The standard version of the story is that Second Lieutenant Thái and flight attendant Mộng Thường met cute during a flight of Air Vietnam, the national airline. A romance ensued over long distance: distance between lovers or spouses was a common subtext in South Vietnamese romantic music. During the Easter Offensive of 1972 – it was called Mùa Hè Đỏ Lửa or The Fiery Summer in South Vietnamese lexicon – he was heavily wounded and went missing at the Siege of An Lộc. By experience, he was presumed dead and Mộng Thường was of course devastated upon receiving the news. Then it turned out that he survived after all, thanks to the help of a nun who hid him at a Catholic church in the area. After the siege was over, he invited her to see him in An Lộc. She took a bus there, but it came upon land mines and blew up, with Mộng Thường among the civilian dead. In Trần Thiện Thanh’s hand, however, Mộng Thường’s name is perfect precisely because of its literal meaning. The last verse begins, Xin cho yêu trong Mộng Thường nhưng mộng thường cũng tan: May I love Mộng Thường but even this ordinary dream has gone! The clever word play devastatingly captures the sorrow and poignancy of the Vietnamese experience of warfare. Nhật Trường’s recording features brass, plucked strings, and a perfect use of the tambourine. (Remember, South Vietnamese records rarely used tambourines.) Strings, tambourine, and bass keep the 1-2 beat steady. Brass starts the song and fills in the foreground between the lines. Though prominent and loud, it doesn’t dominate the vocals. It provides the same support during the instrumental middle that is smartly led by the plucked strings. The first verse offers a philosophical overview about romantic love. There is some rhyming in the lyrics, but I dispense with it this time and will have to come up with a better translation another time. Cũng có lúc thác cùng ghềnh chia đường con nước êm. Trời già như còn ghen tuông, cách chia người trót thương. It moves rough over waterfalls and rapids that split the flow. Listen to this sad tale and weep for the lovers! Even the gods are jealous of this love and split up the lovers. The next verse zooms in on the young woman. Em tên em tên Mộng Thường, cha gọi em bé ngoan. Chàng về đơn vị xa xăm nàng nghe nặng nhớ mong. Her name is Mộng Thường, mother calls her a pretty girl. Her name is Mộng Thường, father calls her a good girl. She loves a young Ranger on a late winter day. Love in wartime is dicey, unsettled, like drifting smoke. He returns to his distant unit; she misses him in her heart. Nhật Trường’s voice elevates to begin the chorus, which tells the heartbreaking pain of loss. Drumming pattern changes to support the lyrics, which are divided into three sections of three lines each, separated by an instrumental line of brass. The repetitive division makes it very easy to hum along. Look around and see so much pain and anguish. Lover does not find the way to future. Một xuân buồn có gió đông qua. Rather to the young lady far away. Wintry winds blow through this mournful spring. Having shifted from her to a narrator, the last verse now shifts to him. It begins as a lamentation and ends as a vow made in honor of love cruelly lost. Note the transitional words from the first three lines: nhưng, sao, bỗng – but, yet, suddenly. The last line uses mộng – dream – again, but this time it is a sleeping dream rather than a waking one. Nhật Trường almost always wrote his own lyrics, and this example reveals the deceptive simplicity of his phrasing that helps to popularize much of his music. Cô dâu chưa về nhà chồng, ôi lạnh lùng nghĩa trang! May we walk the same path, yet fate has come between us. The bride not yet at her new home but, alas, at a chilly graveyard! Listen to this sad tale and weep for the lovers: Trần Thiện Thanh makes the request in the first verse. How could you not shed tears for them by the end? It is hardly a surprise that the song has been very well received among Vietnamese since its release. 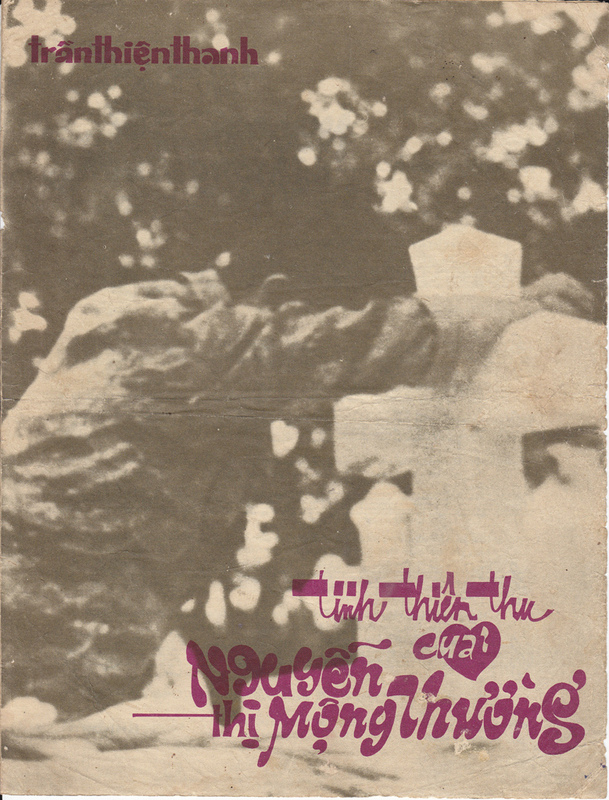 Nhật Trường’s original still stands as the strongest recording to date, but there have been many others made in Saigon before its fall and in the diaspora since then. The most sentimental version comes the sixty-first DVD of Asia’s video series featuring Băng Tâm and Đan Nguyên. (Asia is a media company based in Little Saigon of Orange County, California.) It even includes a scene of dialogue, enhancing the personal and dramatic nature of this ballad. If there could be only one classic among the handful of songs I’ve considered so far, this is the one! Thanks to the artistry of Nhật Trường Trần Thiện Thanh, the story of Phạm Thái and Nguyễn Thị Mộng Thường has been immortalized as one of the greatest tales about the Vietnamese experience of the war. It has to be noted as well that this song and its story echoes “Màu tím hoa sim” by Hữu Loan, a poem which was set by several Southern songwriters. Your translation of “Nhiều lần chàng mộng liêu trai, chàng hẹn nàng kiếp mai…” is good, but needs a footnote. As you know “Liêu trai” refer to the popular Chinese tales – Liaozhai Zhiyi – or as the wikipedia entry translates it – Strange Stories from a Chinese Studio. These stories are as popular in Vietnam as they are in China. Many stories involve nighttime assignations with beautiful ghosts, or beautiful women in the form of magical foxes. Liêu trai suggests a nocturnal, fantastic world of beauty and adventure, along with some danger. Until he leaves this incarnation, he can only wish to enter this world of nocturnal fantasy to rejoin her. Another detail – and it may have no actual relationship to this song. The sheet music for Trần Thiện Thanh’s song “Đôi ngã đôi ta” from 1964 has as an epigram a 10 word poem that was written by someone named Mộng Thường. Yet another detail – this song was evidently used in a filmed play (phim kịch) entitled Mộng Thường. Yes, I should have noted the full title since it appears in the illustration above. It’s been updated in the post.